Last year for my daughter, Annie’s 4th birthday she decided to have a splash and play party at the house and invite all of the kids in her preschool class. We planned out where to put the little blow up pool, bought balloons, a piñata and face paints so there’d be lots of fun activities, and ordered the pizza. Annie decided that she wanted a giant chocolate cookie instead of a cake, so I figured out how to make one (turns out the trick is baking it on parchment paper). The only thing I struggled with having a big party was that I really did not want her to receive 20 presents. We’re very fortunate and she just did not need that many presents. But, people really like to bring gifts to birthday parties. Hmm, what to do instead? After her birthday I made a big deal about all the items she had collected and we took it to the Humane Society together. I could see that she felt proud, and I was proud of her. I think the key is to find something that excites your child. What other “give-back” gift ideas do you know? 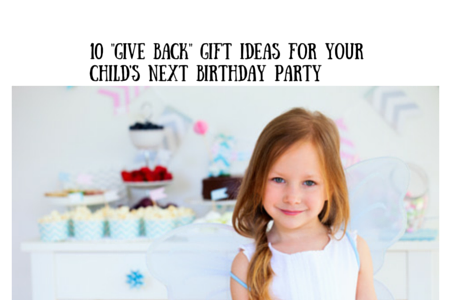 Have you tried a “give-back” birthday party before? Please share your ideas and experiences below in the comments. Like this post, share it!